This simple recipe takes me back to the hills of Tuscany, to the quaint town of Siena. My husband and I were strolling the narrow hilly cobblestone streets and happened upon a restaurant and read its intriguing menu: Ribollita with black cabbage and bread. Fresh pasta with pumpkin, shallots and sage. We immediately booked a table in the romantic tavern and it was so magical to be there! The food was divine, to say the least. So two years later, I still think about Tuscan food and ribollita is a very fitting thing to make if you're looking for a hearty and scrumptious supper. Cavolo nero / Dinosaur kale / Black cabbage / Svartkål are all names for this lovely leaf. 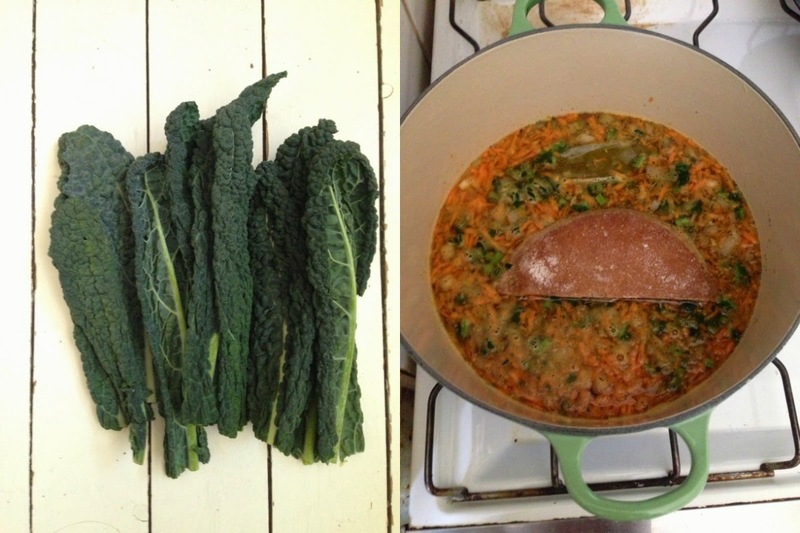 Kale is tremendously popular these days but is traditional in this soup. It's the perfect hearty counterpart offering a good chew and a good dose of greens. Nutritionally speaking, kale's a bomb of nutrition, including calcium, iron, vitamin A and more. 2. Eating foods high in vitamin C help coax out the iron from foods. This article claims that simply adding lemon juice to kale will help. 3. Fermented foods also help with iron absorption. Since I'd like this meal to be about iron, I boost the iron elements with beans. 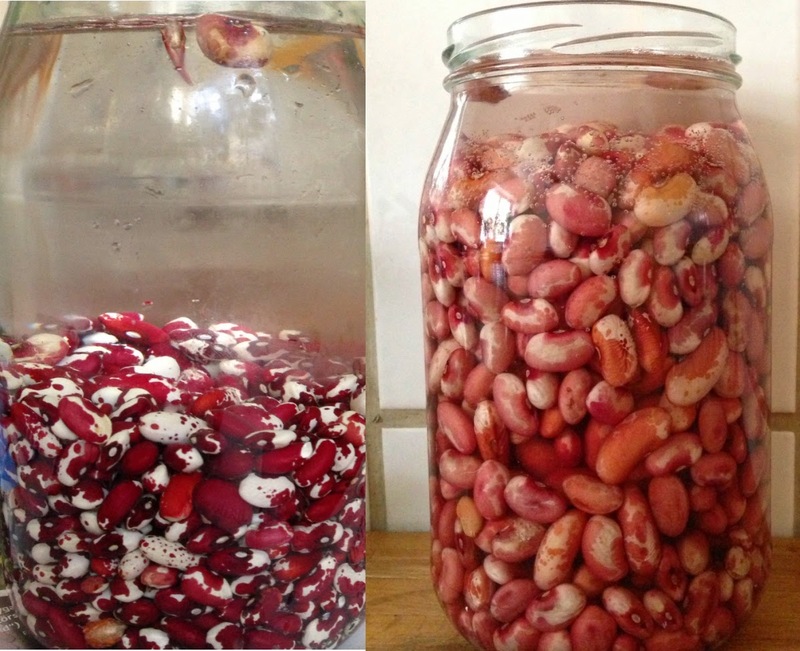 I like to use my beautiful heirloom beans called Jacobs Cattle Trout Beans (also known as Anasazi beans) that I found at the San Francisco farmers market, but you can always use white, navy or kidney beans. I can't wait to go back to the Ferry building for more beans. These days I am even more passionate about legumes as I've acquired the position of marketing legumes for the Swedish Legume Society. It may sound nerdy to you but it's something I truly believe in -- legumes enrich the soil, so farmers love to grow them and use as a natural fertilizer = good for the environment, and they're high in protein and iron -- so important for daily function! And they're delicious! A lot of people avoid eating legumes because they think it causes gas, but in truth, a lot of research has proven that the more often one eats legumes, the less problem they experience because the intestinal bacteria gets used to its fibers. Moreover, soaking legumes not only minimizes gas, but also breaks down the anti-nutrients and allows you to absorb all those valuable nutrients! So please give legumes another chance, and remember, the more you eat it, the easier for your stomach it will be! So I hope you'll give this recipe a try and let me know what you think! 1. De-stem all the kale. Wash the leaves and also wash the stems. Chop the stems finely. Roughly chop the leaves. 2. In a large pot, heat oil and sauté the onions until soft. Add garlic, bay leaf, kombu, carrot, kale stems, bouillon and water. Once it comes to a boil, add the roughly chopped bread and beans. Add the kale leaves to the simmering pot of soup. Cook for 5 - 10 minutes or until the kale is wilted. 3. Garnish with roasted almonds or pumpkin seeds, parmesan cheese and extra virgin olive oil. Enjoy!